During Saturday’s Public vs. Private boys’ basketball showcase at Baltimore City Community College, a DJ often said “He’s getting warmed up,” after a player scored. In the case of Adrian Baldwin and St. Frances Academy, they were ablazed. The Panthers defeated No. 7 Woodlawn, 89-53. The privates won three of five matches as 12th-ranked McDonogh School defeated Randallstown, 69-49, and Prince George’s County’s Capital Christian Academy defeated New Era Academy, 75-63. Top-ranked Patterson and No. 4 Poly represented the public side with easy victories. St. Frances pulled off its second Top 10 upset in less than 24 hours, thanks to a huge performance from Adrian Baldwin. The freshman guard hit seven 3-pointers en route to a game-high 30 points. Friday evening, the Panthers defeated second-ranked Mount St. Joseph, 69-67. St. Frances overcame deficits of 14 (at halftime) and 11 (fourth quarter), forcing overtime on junior Elijah Epps’ basket with under a minute left. Though the Panthers were eliminated from MIAA A Conference playoff contention earlier in the week, St. Frances coach Nick Myles said his young team has progressed. The Panthers carried the momentum into Saturday, building a 47-21 halftime lead. Woodlawn closed to 50-32 to start the third, then Baldwin came to life. The 5-foot-10 freshman, who scored the winning basket in St. Frances’ victory over Chicago’s Morgan Park a few weeks ago, hit back-to-back 3-pointers, extending the lead to 56-32. The Panthers led 71-42 after three as Baldwin hit four 3-pointers in the period. Baldwin continued his torrid stroke, adding two more 3-pointers, giving St. Frances an 80-47 lead midway in the fourth. The Panthers led by as many as 40 points. Jordan Toles added 18 points for St. Frances (14-16 overall), and 6-foot-7 senior post Eral Penn, who received a scholarship offer from Canisius following the game, had 14. Juwan Lane led Woodlawn (17-4) with 18 points. Penn had 20 points, 13 in the second half Friday against Mount St. Joseph, which led 20-8 after the first quarter. Darryl Morsell had 17 points for the Gaels, who didn’t have 6-foot-9 junior center Jalen Smith in the second half because of a sore heel. The Panthers close their regular season this week against McDonogh School and John Carroll School. St. Frances will be on the road for a Baltimore Catholic League quarterfinal March 2. In a matchup of Top 20 squads, No. 1 Patterson got another huge performance from Marvin Price as the Clippers handled 11th-ranked Glenelg Country School, 60-42. Price, a 6-foot-5 sophomore transfer from DeMatha Catholic, totaled a game-best 26 points. Gerard Mungo (10 assists) and Christion Adams each finished with 10 points for Patterson (18-3), which led 34-19 at halftime. Jalen Gabbidon led Glenelg Country School (17-9) with 11 points, and Caidon Owen added 10. The victory clinched the top-seed in the upcoming Class 2A North Region playoffs for Patterson, which lost at Poly in overtime Tuesday. After a lackluster showing Friday against Mervo, Clippers coach Harry Martin was pleased with his team’s showing Saturday. Junior guard Noah Locke scored 13 points and Malik Hudson and Marquis Thornes each added 12 as McDonogh (18-9) handled Randallstown in a rare meeting of northwest Baltimore County squads separated by a couple of miles. John McNeal led Randallstown (11-7) with 12 points. In the nightcap, Poly took over in the second half en route to a 55-40 victory over St. Vincent Pallotti. Senior forward De’Vonde Perry tallied a game-high 23 points and Demetrius Mims added 13. The defending Baltimore City Division I champ Engineers outscored the Laurel school, 37-19, over the final two quarters to win for the third time in four matches this season against MIAA A programs. Poly’s lone loss was an overtime decision to then-No. 1 Mount St. Joseph at the William Wells Classic at UMBC on the opening weekend of the regular season. After overwhelming Glenelg Country School last week at home at the Power Move Winter Showcase, Poly (15-6) didn’t get its first lead Saturday until early in the third on a dunk by Perry. The Cold Spring Lane school went on a 15-0 run from late in the third until early in the fourth. Steve Cannady led Pallotti (12-13) with 12 points, and Everette Hammond added 11. Randallstown – Okojie 1, Lewis 9, Thompson 7, Issacs 9, Makle 9, McNeal 13. Totals 20 6-15 49. McDonogh – Chong Qui 2, Willis 11, Locke 13, Thornes 12, Pickens 2, Little 9, Brown 8, Hudson 12. Totals 30 6-11 69. Poly – Perry 25, Mims 13, Horton 2, Walker 2, Jones 3, Ali 10. Totals 20 13-17 55. 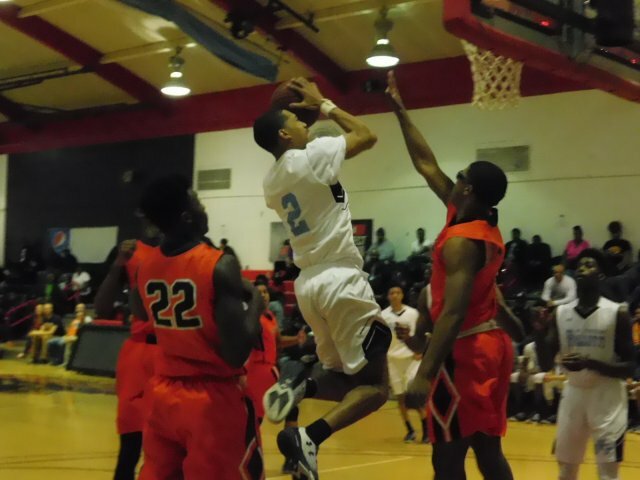 Pallotti – Hammond 11, Cannady 12, Giles 2, Brewer 4, Coulibaly 9, Ola 2. Totals 14 9-12 40. Patterson – Price 26, Mungo 10, Adams 10, Jones 8, Clemons 6. Totals 27 1-2 60. Glenelg Country – Gabbidon 11, Hornatko 3, Nedurmalli 7, Longpre’ 8, Etuaful 1, Burnett 2, Owen 10. Totals 15 9-12 42. Woodlawn – Brinkley 10, Warren 9, Redd 5, Lane 18, Garrison 8, Rice 2, Gannon 2. Totals 22 6-12 53. St. Frances – Baldwin 30, Jones 6, E. Penn 14, V. Penn 2, Toles 18, Davis 8, Epps 8, Turner 2. Totals 35 9-15 89.